The company Europool based in Poland (Mogilno) produces GFK swimming pools and offers an allround service to customers throughout Europe, from manufacturing the pool to assembly, installation, accessories and fast customer service. Their pool production includes different versions. From garden pools which have been available for purchased in DIY stores since early 2018, all the way to customized, more labour-intensive luxury solutions. Europool and BÜFA have a long term business relationship. The company uses BÜFA®-Swim-NPG Gelcoat in a variety of colours for the highest finish quality of the pool. These gelcoats are processed in using the spray-application technology. Furthermore, Europool uses BÜFA®-Resin VE in the hand lay-up and spray lay-up processes. BÜFA delivers a comprehensive portfolio of products connected with pool construction globally and can offer you a wide selection of individual production possibilities. BÜFA®-Swim-NPG Gelcoat combined with a special laminate structure, allows for long-term use at raised water temperatures (up to 35°C). We offer the appropriate machine technology for your optimal processability. BÜFA®-Swim-NPG (Art.-Nr. 752-colour) with superlative osmosis resistance. Recommended processing temperature: maximum 35°C. BÜFA®-VE-Barriercoat-SV, beige, spray quality (Art.-No. 722-1966). Used as an additional gelcoat layer, BÜFA®-Barriercoat - based on vinyl ester resin - improves the surface quality and resistance to osmosis. BÜFA®-Resin VE 0910 (Art.-No. 700-0910), pre-accelerated, thixotropic resin with standard MEKP curing. SYNOLITE 8388-P-1 (Art.-No. 770-8388) for build-up and completion of the laminate behind the “first layer resin”. 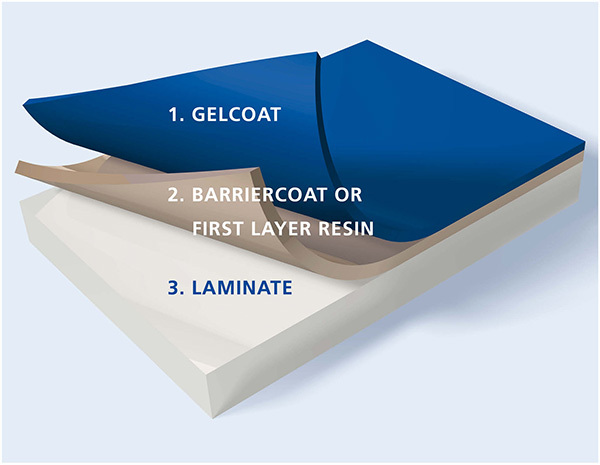 For an optimum surface quality and better Osmosis behavior, we recommend the application of a Barriercoat or a First Layer Resin between gelcoat and the laminate. BÜFA®-Barriercoat is suitable for applications such as swimming pools, boat building, vehicle parts and GFK moulds. 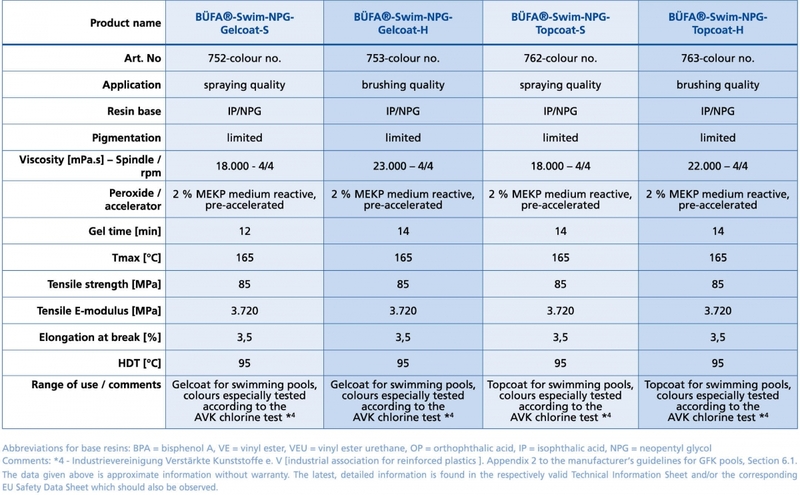 The BÜFA®-Swim-NPG product range is especially suitable for the requirements of swimming pools with regard to long-term chemical, thermal and hydrolytic loads.